Congratulations to the Cumberland Valley Rail Trail for being voted Best Biking in the Valley! The 11-mile rail trail follows the abandoned Cumberland Valley railroad corridor from Shippensburg to Newville. The Cumberland Valley Rail Trail Council also recently completed a mile-section of the trail beginning at Allen Road in Carlisle. This extension is designed to eventually be part of the 11-mile trail that would connect Carlisle to the existing trailhead in Newville. 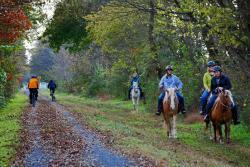 Users of the trail can hike, bike or ride horses on the trail which includes a mix of concrete, asphalt, hard-packed earth and packed stone dust surfaces. The rail trail is a designated National Recreation Trail with interpretative way-point signs on the agricultural and Civil War heritage along the trail. The trail is also a great spot for bird and other wildlife watching. The woods and shrubs adjacent to farms and grasslands provides habitat for dense populations of wildlife including Belted Kingfisher, Cedar Waxwing, Downy Woodpecker, Eastern Meadowlark, American Kestrel, Great Horned Owl, Indigo Bunting, Sharp-shinned Hawk, Common Yellowthroat, and red fox. The Oakville area provides opportunities to observe grassland species such as the Horned Lark.